Esmaeili, S., Irani, M., Moazzeni Zehan, H., Keramatian, B., Tavakoli Harandi, Z., Hamzeloo-Moghadam, M. (2016). Cytotoxic activity of some ethnic medicinal plants from southwest of Iran. 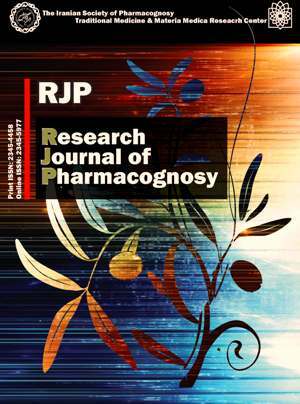 Research Journal of Pharmacognosy, 3(1), 43-47. S. Esmaeili; M. Irani; H. Moazzeni Zehan; B. Keramatian; Z. Tavakoli Harandi; M. Hamzeloo-Moghadam. "Cytotoxic activity of some ethnic medicinal plants from southwest of Iran". Research Journal of Pharmacognosy, 3, 1, 2016, 43-47. Esmaeili, S., Irani, M., Moazzeni Zehan, H., Keramatian, B., Tavakoli Harandi, Z., Hamzeloo-Moghadam, M. (2016). 'Cytotoxic activity of some ethnic medicinal plants from southwest of Iran', Research Journal of Pharmacognosy, 3(1), pp. 43-47. Esmaeili, S., Irani, M., Moazzeni Zehan, H., Keramatian, B., Tavakoli Harandi, Z., Hamzeloo-Moghadam, M. Cytotoxic activity of some ethnic medicinal plants from southwest of Iran. Research Journal of Pharmacognosy, 2016; 3(1): 43-47. Background and objectives: Many people in ethnic groups of the world have trusted in plants for disease management and cure. Medicinal plants have always played a great role in the lives of Iranian people in the past and present and with no doubt in the future. Healers in different regions of Iran have been using medicinal herbs and one rich source for these cures is located in south-west of Iran, Kohgiluyeh va Boyer Ahmad province. Some species from this province have been selected for the present study and their cytotoxic activity has been evaluated. Methods: The methanol extracts of the 26 species were obtained by maceration and the extracts were investigated for cytotoxic activity in MTT assay. Results: The results revealed that four out of twenty six plants were toxic to MCF-7, A-549, HepG-2 and HT-29 cells. Conclusion: The findings of the present study specially the species with lower IC50 values (Eryngium billardieri and Nerium indicum) are suggested for further investigations in cancer studies. Mosaddegh M, Esmaeili S, Naghibi F, Hamzeloo-Moghadam M, Haeri A, Pirani A, Moazzeni H. Ethnomedical survey and cytotoxic activity of medicinal plant extracts used in Kohgiluyeh and Boyer Ahmad province in Iran. J Herbs Spices Med Plants. 2012; 18(3): 211-221. Yasuj: Official website of Kohgiluyeh and Buyer Ahmad governorship; Available from: http://www.ostan-kb.ir/kohgiluye-fa.html. Alley MC, Scudiero DA, Monkes A, Hursey ML, Czerwinski MJ, Fine DL, Abbott BJ, Mayo JG, Shoemaker RH, Boyd MR. Feasibility of drug screening with panel of human tumor cell lines using a microculture tetrazolium assay. Cancer Res. 1988; 48(3): 589-601. Hamzeloo-Moghadam M, Esmaeili S, Fotoohi F, Naghibi F, Pirani A, Hajimehdipoor H. In vitro evaluation for cytotoxic activity of three Ferula species. Int J Pharm Sci Res. 2013; 4(7): 2673-2676. Hamzeloo-Moghadam M, Firouzi J, Saeidnia S, Hajimehdipoor H, Jamili Sh, Rustaiyan A, Gohari AR. A cytotoxic hydroperoxy sterol from the brown alga, Nizamuddinia zanardinii. Daru. 2013; 21: 24. Wang P, Su Z, Yuan W, Deng G, Li Sh. Phytochemical constituents and pharmacological activities of Eryngium L. (Apiaceae). Pharma Crops. 2012; 3(1): 99-120. Kartal M, Mitaine-Offer AC, Paululat T, Abu-Asaker M, Wagner H, Mirjolet JF, Guilbaud N, Lacaille- Dubois MA.Triterpene saponins from Eryngium campestre. J Nat Prod. 2006; 69(7): 1105-1108. Yurdakök B, Baydan E. Cytotoxic effects of Eryngium kotschyi and Eryngium maritimum on Hep2, HepG2, Vero and U138 MG cell lines. Pharm Biol. 2013; 51(12): 1579-1585. Bogucka-Kocka A, Smolarz HD, Kocki J. Apoptotic activities of ethanol extracts from some Apiaceae on human leukaemia cell lines. Fitoterapia. 2008; 79(7-8): 487-497. Mae SH, Sofia M, Bolhuis RL, Nooter K, Oostrum RG, Subagus W, Ibnu GG. Selectivity of compounds isolated from the leaves of Nerium indicum Mill. on various human cancer cell lines. Med J Malaysia. 2008; 63(suppl): 24-25. Hamzeloo-Moghadam M, Eslami Tehrani B, Pirani A, Hassanpour A, Esmaeili S. A survey about prophage induction ability in Escherichia coli K-12(λ) by ethnic medicinal plants of Kohgiluyeh va Boyer Ahmad, Iran. Res J Pharmacogn. 2014; 1(4): 7-10. Fatima H, Khan K, Zia M, Ur-Rehman T, Mirza B, Haq IU. Extraction optimization of medicinally important metabolites from Datura innoxia Mill. : an in vitro biological and phytochemical investigation. BMC Complem Altern M. 2015; 1915(1): 376. Vermillion K, Holguin FO, Berhow MA, Richins RD, Redhouse T, O'Connell MA, Posakony J, Mahajan SS, Kelly SM, Simon JA. Dinoxin B a withanolide from Datura inoxia leaves with specific cytotoxic activities. J Nat Prod. 2011; 2574(2): 267-271. Mojab F, Poursaeed M, Mehrgan H, Pakdaman S. Antibacterial activity of Thymus daenensis methanolic extract. Pak J Pharm Sci. 2008; 21(3): 210-213. Ghasemi Pirbalouti A, Rahimmalek M, Malekpoor F, Karimi A. Variation in antibacterial activity, thymol and carvacrol contents of wild populations of Thymus daenensis subsp. daenensis Celak. Plant Omics J. 2011; 4(4): 209-214. Amirghofran Z, Hashemzadeh R, Javidnia K, Golmoghaddam H, Esmaeilbeig A. In vitro immunomodulatory effects of extracts from three plants of the Labiatae family and isolation of the active compound(s). J Immunotoxicol. 2011; 8(4): 265-273. Zarshenas MM, Krenn LA. Critical overview on Thymus daenensis Celak. : phytochemical and pharmacological investigations. J Integr Med. 2015; 13(2): 91-98.